this absolutely made my mouth water. Rich and creamy,,! Preheat oven to 350 degrees. Spray a 9" springform pan with cooking spray and place on baking sheet. FOR CRUST: Combine cookie crumbs and butter in small bowl. Press onto bottom and 1-inch up side of 9-inch springform pan. Bake for 6 to 8 minutes (do not allow to brown). Cool on wire rack for 10 minutes. FOR CHEESECAKE: Beat cream cheese and brown sugar in large mixer bowl until creamy. Add pumpkin, evaporated milk, cream, eggs, cornstarch and cinnamon; beat well. Pour into crust. Bake for 60 to 65 minutes or until edge is set but center still moves slightly. Remove from oven. FOR TOPPING: Combine sour cream, granulated sugar, cinnamon and vanilla extract in small bowl; mix well. Spread over warm cheesecake. Sprinkle with milk chocolate toffee pieces. Bake for an additional 8-10 minutes. Cool for 10-15 minutes in pan on wire rack. Gently run a thin knife between cheesecake and pan and allow to cool completely. Cover cheesecake with plastic wrap and refrigerate for several hours or overnight. Remove side of springform pan. 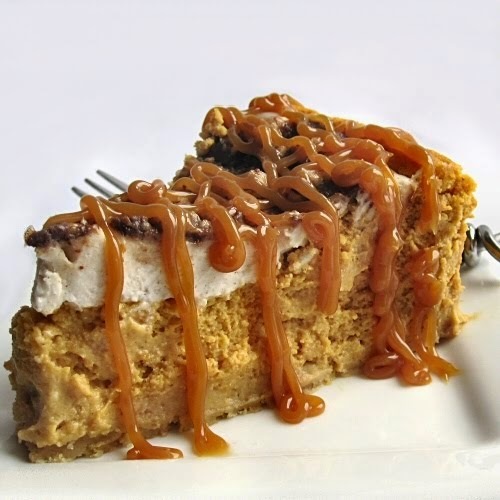 Drizzle with caramel topping before serving.